Homeowners are not the only victims of break-ins. Business owners are also cursed with this crime, and sometimes much more so. For the average criminal, an office tends to be a more lucrative mark than the average household. This means that commercial businesses have to be vigilant when it comes to guarding their property and handling their security. However, dealing with commercial theft and break-ins, is a lot more complicated than dealing with home break-ins. The reason behind this is simple. Businesses have to contend with exterior threats as well as interior threats. This means that not only do they have to plan for outside burglars, but most businesses have to plan for their employees as well. $50,000,000 is the average amount stolen annually from U.S businesses by their employees. The first step to rebuilding your commercial security plan simply involves assessing the security plan that you currently have in place. Although your current security measures may have failed to prevent a break in, there are still some core parts of it that can be salvaged. An assessment helps you view your commercial security plan objectively, and then work to better it. Essentially, you will be studying what it gets right and what it does not. The best way to assess your commercial security plan is to answer the hard questions that need to be answered. Below, I will walk you through the questions that need to be asked, so you understand how to approach a security plan assessment. This should help identify any weak points you might have after a break in and work to better them. Keep in mind that some vulnerabilities might have been present before you were victim to an office break-in. 1. How do you treat commercial security? Commercial security does not only depend on having the most robust security measures in place or building the best security for your shop or office. At its core, commercial security depends on the vigilance of the parties involved. Implementing security measures would mean very little if everyone in your office had a complete disregard for them. The way commercial security is treated is intrinsically reflective of its effectiveness. If security is an afterthought in your company culture, then your office space will always remain vulnerable because there is no one vigilant enough to enforce your security measures. If security is treated in a lackadaisical fashion, what is to stop an employee from breaking in after hours? What stops a burglar from attempting a break-in? 2. What physical security measures do you currently have in place? 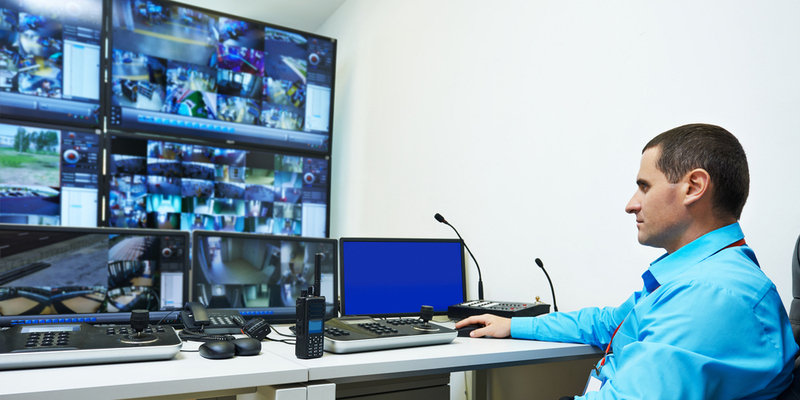 Every commercial space should ideally have some physical security measures in place. They can be as simple as using the best front door locks, but they should be geared towards limiting unauthorized access in some capacity. If your office recently suffered a break in, it could mean that the physical security measures that you had in place were not adequate enough. Ideally, your physical security measures should cover all potential access points into your office space. Offices, similar to homes, have multiple access points and each of these needs to be fortified against break-ins. Security is most effective when it is implemented in layers. If you have subpar physical security measures in place, they will have to be revamped in your rebuilding efforts. Taking the time to assess what you have will help you choose the right elements when you are rebuilding. 3. How are security policies enforced? If office security policies are not enforced, it means very little to have physical security measures in place. A business’s security policy outlines the way in which security measures are handled and executed. It dictates what should be done if security is breached and it also sets the tone for the way people in your office view security. If there are no systems in place to enforce security, then no one will hesitate in attacking them. 4. What are potential targets? I like to find the silver lining in all things. The silver lining to an office break-in us that it highlights what was targeted. If you were lucky, nothing was taken, but luck only favors the prepared. Therefore, if your security was not up to par, sadly you were not prepared. Every office space is different, as such, burglars will have different targets that they are after. Being able to identify what someone is after influences the fortifications you put in place. For example, if your office was broken into and expensive equipment was stolen, you will know what to fortify. On the other hand, if someone broke in attempting to access information, you will also be prepared to adequately approach this. 5. Which access points are vulnerable? As I pointed out, security measures work best when you focus on the layers that bring them together. As such, you will have to look into which access points of your office space are vulnerable. For some office spaces, this will be rather easy to identify after a break in, especially if you have surveillance systems in place. However, this is not always the case, so regardless of whether you know how someone broke into your office, assess the security for all your access points the same way. Doing so will help you realize which access points should be prioritized. Fortifying your access points should a top priority when you are rebuilding your commercial security. If your office was broken into, it usually means that there is a flaw in one of the access points that leads into your office. Most commercial spaces make the mistake of focusing on some access points and ignoring others. All this serves to do is to weaken your commercial security in the long run. Leaving one access point insecure is all it takes for your office to be broken into again. Take the time to identify all potential access points. Keep in mind that because office spaces differ, the access points for one office will not be the same for another. Some offices only have a front door and a back door, while others have multiple front doors, service stairways, garage doors, etc. Any potential access point that can be compromised should be fortified. Most burglars will target doors and windows, so business owners should focus most of their time and energy on fortifying these points. There are various commercial door lock types that business owners can use to their advantage. I understand that every business owner loves to save money, but do not skimp when you are buying commercial door locks. The cost of door lock prices often reflects their security level, so do not shy away from commercial door locks that might seem expensive. In addition to fortifying doors and other entryways, business owners should actively reinforce their window security as well. Install commercial grade security locks on all doors and windows as well. If your windows do not have locks, pair them with window security film that prevents criminals from breaking in by means of shear force. I always advise that commercial business owners take the time to talk over their commercial security needs with a commercial locksmith. They are likely to be the best resource to help you choose the right locks for you needs, and they can also help you implement some of the other measures we will discuss below. Also, fortifying access points with alarms and surveillance cameras helps elevate your security. Business owners don’t necessarily need to break the bank here because there are several cheap security cameras that are simple to set up that can be bought. Taking the time to position these security cameras adjacent to doorways and other access points will help you monitor the way your office space is being accessed. Keep in mind that there are some general filming restrictions you will have to account for when installing security cameras in an office. Monitored security alarms also come in handy when business owners want to fortify access points. They give you a way of staying alert and abreast with the security in your office. There are many considerations to be made for perimeter security, and each one of these considerations is meant to make your office more secure. Fortifying access points is all well and good, but it achieves very little if the perimeter of your office building is not secured as well. Burglars and criminals often exploit the weaknesses of a building’s perimeter security and capitalize on this to break in. Ideally, your perimeter should restrict access in a way that deters burglars from attempting to break in. One of the best ways to do this is to utilize high-security padlocks on security gates and fences, as well as implementing access control measures. I will discuss access control in more detail below, so forgive me for not explaining it now. The reason why perimeters are often easily exploited is that they have a lot of blind spots, and it is likely that one of these blind spots was used to compromise your current security plan. As such, your main focus should be to increase visibility on your perimeter, while implementing more stringent access methods. The access methods that you implement should keep burglars out, and reduce the likelihood of one of your employees successfully breaking in. Access control measures also help on this front. They are best paired with surveillance, effective lighting, and barriers. Each of these elements effectively limits a number of hiding spots that a burglar can take advantage of, and it makes your office security rather difficult to overcome. Install surveillance cameras at vantage points that negate all your perimeter blind spots, and pair these with motion activated flood lights. For some businesses, it might help to install a security gate and invest in security guards to man external access points. This should ideally be done for offices that operate on a large property. A measure like this would be a waste of resources for the small business owner. The layout of your office building influences the extent and scope of your commercial security plan. In rebuilding your security plan, you have to factor in the role that your office layout plays in keeping your office space safe and preventing future break-ins. If your office suffered a break-in, it might be a clear sign that it is time for a change. In doing this, business owners will have to take several things into consideration. You will have to consider the way employees use the office space, the way clients use the office space and also what your security priorities are. For some business, expensive equipment and products might be the focal point of security, while for others it might be information security. These factors will help you shape the layout of your office space in a way that promotes security. The main purpose of doing this is to make it harder for a break-in to happen. Ideally, your office should be adequately spaced in a way that makes the workspace visible. Cramped office spaces make it easier for crimes to go unnoticed, and it also makes it difficult to single out someone that might have broken in. Even if surveillance cameras are used in such spaces, they might not be effective because different things are all meshed together. Surveillance cameras perform best when used in locations where everything is clearly visible. Furthermore, arranging your office with security in mind helps you place expensive equipment, products, and other potential targets behind suitable barriers. These barriers could be locked doors or office security safes. The solution that you implement will depend on what you are trying to keep secure. Access control, as the name suggests, helps limit the scope of access that individuals have to different sectors of your business. Now, this is something that every business owner should implement after a break in. Access control measures, when implemented properly, help prevent external and internal crimes by compartmentalizing parts of your office space. These measures can easily be tacked onto other physical security measures that might already be in place. For instance, keypad door locks are an effective access control tool. The purpose of implementing access control measures is to simply ensure that only the people who have been granted access have access. Installing these kind of access control locks at all major access points on the interior and exterior of your office building minimize the possibility of someone breaking in. Access control systems are usually customizable, which means that you can tailor the scope of your system to the nature of your business. Much of the information that you gathered during your initial commercial security assessment can be used to help you determine which access control system works best for your commercial space. You will have to factor in the size of your business and the number of employees you have to choose a solution that caters to you. Another benefit of access control measures is that they log user information which means that in the event of a break in, you will likely know how your system was accessed and by who. As I started out by saying, the way a company treats commercial security often reflects how effective their commercial security measures are. It is often the case that businesses who pay no mind to commercial security have to deal with break-ins and security hazards more frequently. In reassessing your commercial security after a break-in, you have to also implement measures that help keep your security running. The best way to to do this is by creating a security maintenance schedule that allows you to regularly assess the way each of your security measures is holding up. Also, getting your employees and members of your team involved in commercial security only serves to bolster your security measures. It creates a security culture in which every team member is on alert and trying their absolute best to keep security a priority. Not only does this reduce the possibility of internal break-ins and employee theft, but it reduces the chance of a burglar breaking in due to an employee’s negligence. Commercial security is a tough cookie that requires time and patience to craft. In attempting to rebuild your commercial security, the most important thing you can do is learn from your past mistakes. This is the reason why you should always conduct a prior assessment before you implement any new measures. Take the time to see what went wrong, so that you can build against it. Also, keep in mind that there is no singular solution to commercial security, and building it depends on several different solutions coexisting. Figure out what works for your office space based on what we discussed above and implement the solution to fit your needs. If you have any questions at all, feel free to leave a comment below.